A pack of military bred Rottweilers is being transported across the country in a truck when an accident sets them free. They head for the small mountain community of Lake Lure. When the locals start turning up dead and very mangled, the sheriff decides his best course of action is to assemble drunk yokels with guns to hunt down whatever is killing people. It doesn’t go very well, as you would expect. Popular culture seems to favor an evil dog breed du jour. Pitbulls have held the spotlight for some time. Dobermans were the sinister killers for a while, and somewhere in the 1980s Rottweilers enjoyed a brief reign as the public's most frightening kind of dog. Horror is often an expression of popular fears and anxieties, so it’s no surprise that a film would center on a pack of government bred Rottweilers laying siege to a small town. It is the perfect package to deliver on worries of the military, science gone awry, and a breed of dog that was seen as a public menace. in a 3-D movie prior to this one is a mystery. Rottweiler: Dogs of Hell is a great example of a film that doesn’t set out to forge a new path, and is more than happy to be a serviceable piece of familiar genre story telling. The movie uses the well-worn Jaws (1975) formula with a sleepy town, put-up authority figures, and slow to react officials. It does mix things up very slightly by having a seemingly sympathetic scientist turn out to be less than kind. It also sets out to replicate the languid pace of Jaws, but takes it too far and never really capitalizes on the building tension until the last twenty minutes or so. Rottweiler: Dogs of Hell was original filmed for a 3-D presentation, and it has several gratuitous shots with things flying at the camera. 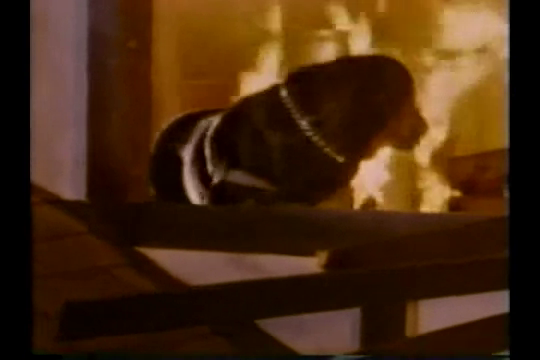 The initial dog attacks are mostly off screen with brief glimpses of the aftermath. I worried that the movie was going to pull its punches too much, but as it draws closer to the climax, it indulges in some vicious and brutal attacks. The film even dips ever so slightly into splatter territory; a welcome surprise for something I feared was going to be tepid. Welcome to Hell... wait... yeah, welcome to Hell. Most of the characters, including the lead, Earl Owensby, feel like interchangeable fodder for the dogs. The only one of note is Dr. Adam Fletcher (Bill Gribble), and that is mostly due to his last minute turn from concerned scientist to violent would-be murderer. Even the dogs lack any personality. I doubt anyone went into Rottweiler looking for deep characterization, but it would have been nice to have a character or two to invest the viewer. 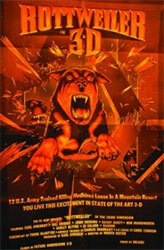 Rottweiler: Dogs of Hell is an unassuming yet still fun slice of canine horror. There is nothing earth shaking or amazing about it, but it does offer some solid entertainment and plenty of monstrous dogs doing monstrous things. The real horror here is the slow uneventful trod it takes to get to the good stuff.